A lot of people ask about the tools used in accounting tools for small business or for those used to run this blog, so I thought it’d make sense to put together a list for your reference here. If anything is missing from this list that you’d like to see, drop me a note and I’ll get this updated. I recommend bookmarking this site for convenience. Disclosure: Please note that some of the links below are affiliate links, and at no additional cost to you, I will earn a small commission if you decide to make a purchase. I only recommend these products because they are helpful and useful. If you don’t think you have a need for these products or that they will help you achieve your goals, please DO NOT BUY THEM. Entrepreneurial Finance: is the first book I read about entrepreneurial finance. Fortunately, I had the privilege of being able to take the author’s course at Kellogg. Unfortunately, Profess Rogers gone back to his alma mater, Harvard, to teach but that was easily one of the top 2 courses I took there. In case you’re wondering, the other course was called Empirical Methods, taught by Professor Leemore Dafny. More on great classes here. Youtility for Accountants: This books is one of the few I’ve read that takes concepts frequently found in the online marketing space and brings it to the field of accounting. I like the book for it’s clear message on how accountants need to change how they do business. Setting up a website, adding a contact page, and waiting for the droves of customers to come pouring in isn’t going to work now, and I’m not sure it ever did. This read is quick, easy, and inexpensive. 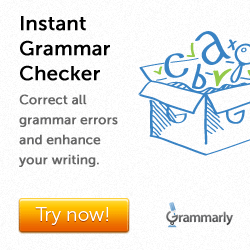 Grammarly: If you struggle with grammar or are just looking for a way to trim time on any sort of writing you do, from personal blog post to business email, Grammarly provides a cool to help with that. I actually wrote about it a while back where you can see some screenshots (click here to read the review). Since then they’ve added a Microsoft add-on feature (only for PC) and a Chrome extension that can edit directly in WordPress, Gmail, etc. Bluehost: It took me a while before I revisited running a website. My first one back in 2006 but between my not doing enough research and not really liking my original provider, I decided to let that site go. This time around the process was simple. I was able to install the WordPress software that runs my site on the server in minutes and the customer service is amazingly responsive via phone, chat, and on Twitter. Frustrating in the moments when you need to use that service but I’d be in worse shape if it wasn’t there. Studiopress: For a while, I tried out a bunch of different free themes, of which Customizr was my favorite. It had decent forum support, but eventually I felt like I was ready to take my site to the next level. One thing that I value in any product or service is customer support and that’s why I decided to try Studiopress. The price point isn’t the lowest, but the customer service and design are great, and I felt like the trust was already there with Copyblogger since I’ve been a long-time reader/listener of content they produce.